I was very pleased with the roasted cauliflower soup that I made about a month ago, and have been thinking of roasting cauliflower and doing something with it. Yesterday, I found cauliflower heads at a great price in sale (under $2) at Weaver Street Market, so took advantage and bought a head. As I did when I made the soup, I was going to roast the florets at 400°F via convection baking for 15m, after first mixing in coconut aminos garlic sauce. I'm not sure why, but the cauliflower was nicely roasted after 12m, so I stopped at that point. As with much of my cooking, I often improvise as I'm cooking. My original thought was to make a roasted cauliflower side dish or maybe puree roasted cauliflower and make a sauce (I'll do that sometime!). But when thinking of a protein to serve it with, I didn't have time to make beans but remembered that I had some lentil pasta (Tolerant Foods brand green lentil penne). It's a great product that has one ingredient - organic green lentil flour. Each 3.5 ounce serving of the pasta has 25g of protein, 11g of fiber, and 2g of fat. 11g of fiber! In Food for Life classes, we recommend that adults eat 40g of fiber a day - one serving of this pasta, even with no vegetables or anything else, gets you a quarter of the way there! I served the pasta, then put the cauliflower on top. I roasted some sesame seeds in a cast iron pan and sprinkled those on. 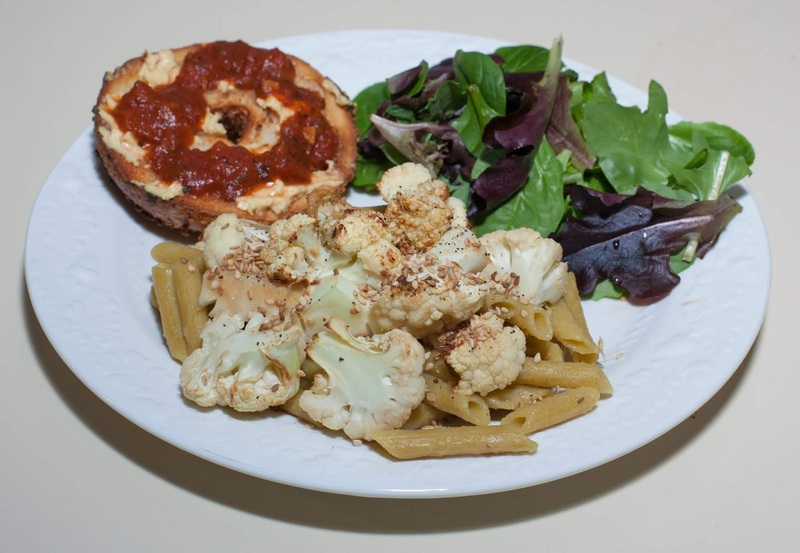 I also served a bagel half with a smear of Miyoko's vegan "cheese" (9g of fat per ounce, but I used at most 1/4 or 1/5 ounce per serving) plus marinara. It was delicious! Dinner was good. My daughter didn't like the penne as much as my wife and I did, and the pasta was rather sticky. I love the nutrition of the pasta. I should make this pasta in dishes where it could shine, with an appropriate sauce or maybe as part of a caponata dish. I'd like to experiment with more roasted cauliflower dishes. Kalamata olives would go well with roasted cauliflower.